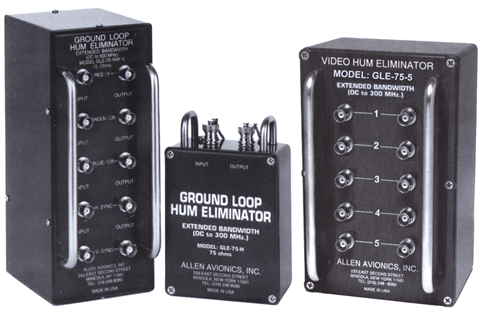 The GLE Series of high frequency hum eliminators will protect all high-speed video or data in coaxial distribution systems from ground loops and electromechanical interference caused by power lines and interfering RF sources. Common mode currents present in shielded cable transmission systems are removed by providing an effective reduction (50 to 60 dB) of CMV (Common Mode Voltage) at power frequencies (50Hz, 60Hz and 400 Hz). The GLE Series is ideally suited for use with wide bandwidth, high resolution video projection systems that require bandwidths of 350 MHz or more. High speed video routers, data switching or distribution systems or any high speed analog or digital networks that employ high frequency video, serial data or high frequency control signals will also benefit from the use of a wide bandwidth hum eliminator.